This is a unique time in science, one that has witnessed a change in the understanding of gravity, one of the four fundamental forces of nature. This change is shepherded by the imminent detection of gravitational waves. Facilities such as the Laser Interferometer Gravitational-Wave Observatory (LIGO) are now in discovery mode. Gravitational waves and binary black holes have been discovered, observed for the first time! Fundamental to the success of the search for gravitational waves is the theoretical modeling of the sources that produce them. Numerical relativity has begun to successfully solve Einstein’s equations governing gravity for the strongest source of gravitational waves, the final few orbits and plunge of two black holes. Taken together with gravitational wave detection, these models probe the mysteries of relativity by interpreting what nature is telling us about gravity. The end result may just be a whole new way of looking at gravity. 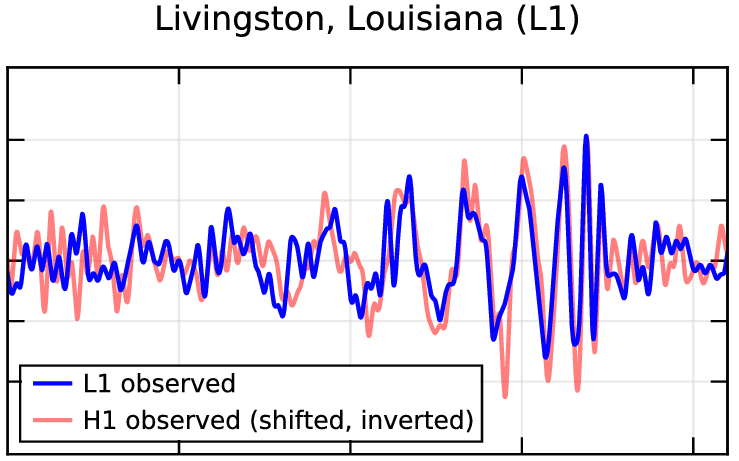 Below is a plot from the publication about the first gravitational wave event showing the gravitational wave strain as a function of time at the two LIGO detectors in the US located in Livingston, Louisiana (L1) and Hanford, Washington (H1). More about this data can be found at the LIGO Open Science Center. The image that appears on the header of this website comes from the cover image of the 2011 School of Physics’ Resonance magazine. The image depicts the tracks of two black hole as they orbit each other. Read the paper.